What a nice table. We moved this Brunswick Barrington. This was one of Brunswick's most valueable tables a few years back. If I remember right it was valued around $10,000. Fast, Accurate, Reliable Pool Table Movers, Installation and Refelting for all brands, makes and models of pool tables. LIFETIME WARRANTY ON LABOR AND LEVEL!!! All Services Licensed and Insured!! Our pool table services include a FREE!!! complete inspection. 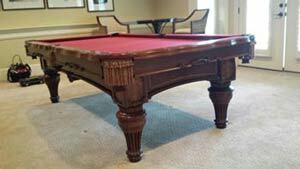 Learn more about our POOL TABLE INSPECTION SERVICE. New or old, 3 piece and 1 piece slate pool tables. "Very professional and well trained crew. If you want your pool table moved correctly call Larry. Protect your investment. After the move and reassemble they leveled the pool table and cleaned it for me. Now I can enjoy those nice slow accurate shots I couldn't do before. 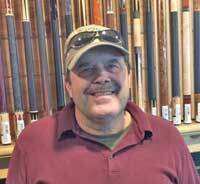 If I need anything such as another move or if I need a refelt I will be calling Larry at Metro Billards. Larry, thanks again amazing work!" In addition to being pool table movers, we also offer a complete list of pool table services in the Atlanta area: Re-felting, Re-cushioning, Disassembly, Installation, Moving for carpet/wood flooring, Slate Crating and More.